Under the category of “did you know” comes these little tidbits about gargoyles, about which I did my final discussion board post for art history class. 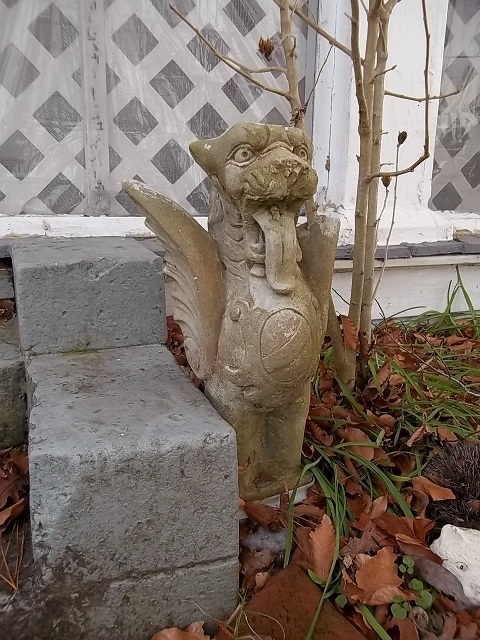 I also took a picture of our garden gargoyle “Boo Boo” whom we rescued from a debris pile back in my home town. He’s missing his toes and a piece of his wing. The word gargoyle is believed to come from an old French word ≥garguille≤ which means throat. The original function of a gargoyle was to direct water away from the cathedral, and were similar in shape to a throat. This French word is also the origin of the English words gurgle and gargle. Today any drainpipe leading off of a building is technically referred to as a gargoyle. A carving that does not direct water is a grotesque. If a carving depicts a combination of two or more beasts it is a chimera. Folklore held that the gargoyle frightened away evil spirits while serving its practical function. After the introduction of the lead drain in the 16th century, gargoyles primarily serve a decorative purpose.